Known as Ford’s Super Duty pickup truck, the F-250 has been the American workhorse since it was first introduced. Ford’s F-series of pickup trucks have been in production since 1948, and has been produced continuously ever since. In 1998, the F-250 changed body style from previous model years, and officially joined Ford’s Super Duty series. The F-250 pickup truck has been used recreationally, and as a working vehicle in the United States since it first rolled off the assembly line. The 2015 Ford F-250 did not undergo any major transformations, but it was updated to include a brand new standard engine that offers drivers more capability than ever before. With that new engine, comes a new standard for Super Duty towing power and capacity, unheard of in previous model years. For the ultimate in pickup luxury, drivers can opt for the King Ranch or Platinum models of the F-250, both of which feature the highest-end equipment and amenities. The entire F-Series of pickup trucks is well-known for its powerful capabilities, and the F-250 is no exception. The standard engine offering on the 2015 F-250 is an impressive 6.2-liter V8 that packs 385 horsepower and 405 lb.-ft. of torque. This powerful engine is the standard on Ford’s F-250 models in previous years, as well as 2015. The most exciting news regarding the F-250 comes from it’s all-new diesel engine option. The 6.7-liter turbo-diesel PowerStroke V8 is a pure workhorse featuring an output of 440 horsepower, and 860 lb.-ft. of torque. This option on the F-250 pickup features a larger turbocharger, new injectors and fuel pump, and a new temperature control system. All of these work together to create increased power and performance for the 2015 Ford F-250, unheard of in previous model years. Both engines come standard with a six-speed automatic transmission and rear wheel drive. Drivers can opt for a four-wheel drive version of the full-size pickup truck, making it even more capable on and off the road. It is no secret that Ford’s PowerStroke diesel engine offers drivers more power than any other pickup truck on the road, but what about towing capacity? 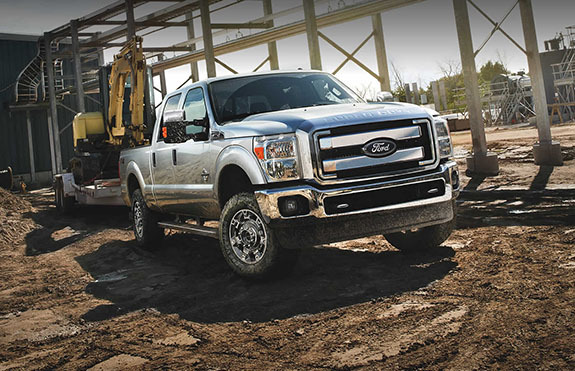 The 2015 Ford F250 can tow up to 16,800 pounds, crushing the competition. Check out how other trucks in the same class, that come comparably equipped, stand up to the 2015 Ford F250. 2015 Chevy Silverado 2500 HD: With 397 horsepower and 765 lb.-ft. of torque, this pickup can only offer a max towing capacity of 14,500 - over 2,000 pounds less than the F-250. 2015 Ram 2500: The 5.7-liter HEMI V8 on the Ram 2500 can only offer 383 horsepower and 400 lb.-ft. of torque, for a total towing capacity of 13,870. The Ram 2500 clearly can not stand up to the power of the F-250. The 2015 Ford F-250 is the clear front-runner when it comes to needing power, performance, and towing capability. The other trucks in its segment simply cannot compare. For those who seek the highest level of luxury in their full-size pickup truck, the Ford F-250 Platinum and King Ranch models deliver. Featuring the highest quality in materials and amenities, the Platinum and King Ranch F-250’s go above and beyond other luxury pickup trucks. Check out what each of the 2015 F-250 trim levels offer drivers, all for one reasonable price. 2015 Ford F-250 Platinum: For the ultimate in F-250 luxury, drivers can choose the 2015 Platinum model. Starting at $55,545, this full-size pickup truck exudes luxury around every corner. No other vehicle in its class has as much class, or overall luxury features. The 2015 Ford F-250 Platinum model truly lives up to its name, in every possible way. This model comes standard with the same powertrain as the King Ranch, with the optional 6.7-liter PowerStroke Diesel engine. Either way, this Platinum pickup truck is as powerful as it is luxurious. Exterior: The outside appearance of the F-250 Platinum is unique to the model, and makes a true stand-out appearance on the road. It comes packed with everything the King Ranch model offers, with even more standard features. 2015 Ford F-250 King Ranch: With a starting MSRP of $51,835, the King Ranch offers a unique option for drivers looking for practical luxury, in a powerhouse of a pickup truck. This Super Duty trucks features a 6.3-liter V8 engine that is capable of accepting E85 gasoline. Teamed with the TorqShift six-speed SelectShift automatic transmission, this truck delivers on all power and performance expectations. 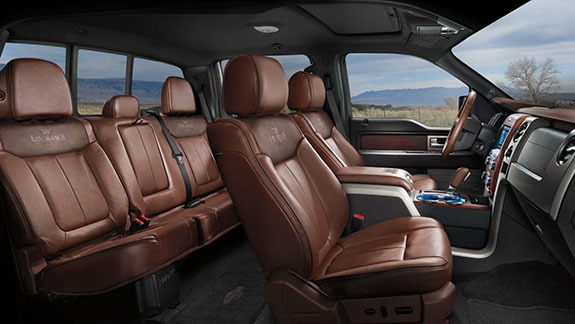 Also expected, is a high-quality interior and exterior, that the King Ranch more than delivers on. Various powerpoints throughout front and rear of cabin including 110-volt outlets, and auxiliary ports.